The Cane Corso originated from Italy. The breed would hunt boar and watch over its owner's property. 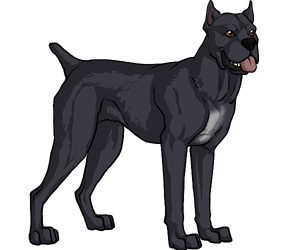 However, before 1988, the Cane Corso was only known in Southern Italy. It was considered very rare, but feature in many Italian paintings throughout history. -The breed has been featured in many paintings, including ones by Bartolomeo Pinelli. -The Cane Corso is an ancient Italian Molossian. -Has an amazing sense in smell. No avatars for this breed.